“We should have taken the oil, then ISIS would not have been able to form because the oil was their primary source of income,” warrior Trump said of a rival clan with whom he'd previously clashed battle axes. 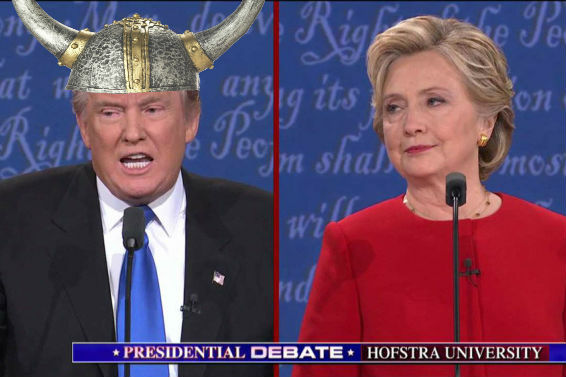 “Just make me President, and give me ten dozen strong Huskarls, and Odin will guide us to victory. “I'll even take some Valkyries aboard, so long as they're not fat pigs,” Trump clarified, while his opponent Hillary Clinton scrawled notes and looked dazedly into the camera. Donald Trump, known to his Thralls as Dagfinn the Orange Death, had weathered a lot of criticism in the lead-up to this debate about his fitness for foreign affairs. He quickly put those critics to shame by detailing his plan to steal the most valued resource of a struggling nation with whom we were ostensibly allied, and load the looted spoils onto longships for the long journey back to Wilmington Harbor. “I've also stated in the past that we need to take out terrorists' families, and I stand by that,” Dagfinn continued, further waggling a middle sax blade at international law. “We need to storm their beaches on foot, overrun their tribal villages, raze their huts and their temples to the ground, and possibly even make off with some sceattas worth of silver swag. It's gonna be a beautiful thing.